Is your passion shopping and chocolate cake? And have you just discovered that your budget is shrinking? Are those luxuries no longer affordable for you and are you now looking for a cheap eat and a budget place to shop? 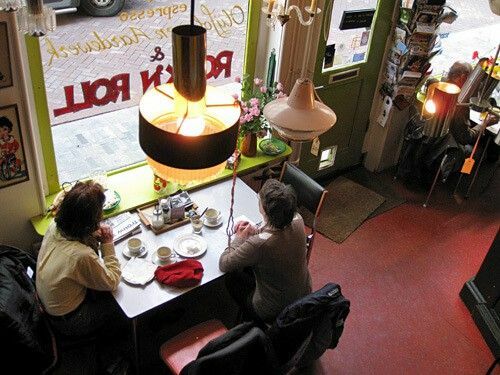 Eetcafé Latei in Amsterdam is both and a well-kept secret. Eetcafé Latei is located right in the middle of the Amsterdam Red Light District. Sip your coffee while listening to Françoise Hardy, Johnny Cash or Bowie. Tuck in scrumptious apple pie or smooth chocolate cake while you are sitting at a table that can be yours for a mere song. Or would you rather have the framed needle-point cat with kittens, the enameled bread bin, the 1970s ceiling lamp or the tattered Teddy? No problem, because the entire content of Latei is price-tagged. Everything can be bought, except staff, because eetcafé Latei doubles as bric-a-brac shop. The menu is short and to the point listing freshly made vegetable soup, goat’s cheese sandwiches and simple Indian meals, including vegetarian options. Apple pie, cheese and chocolate cakes are specialties difficult to resist. The big surprise is your bill. If you haven’t bought that big jigsaw puzzle of Swiss mountains or the framed cat your bill will not be more than €10. Monday, Tuesday and Wednesday 08.00 – 18.00, Thursday and Friday 08.00 – 22.00, Saturday 09.00 – 22.00, Sunday 11.00 – 18.00.